The LifeVest wearable defibrillator is the first and only wearable defibrillator for patients at high risk of sudden cardiac arrest (SCA). The non-invasive device, approved by the FDA in 2002, provides emergency defibrillation and has been worn by over 20,000 patients, and has a 98 percent first shock success rate for treating patients for SCA without requiring bystander intervention. Timely emergency defibrillation is the single most important factor in saving a SCA victim's life. If it detects a life threatening rhythm, the LifeVest alerts the patient to allow a conscious patient to prevent a shock. If the patient is unconscious, the device delivers emergency defibrillation in the form of an electrical shock to restore normal rhythm. The entire event, from detecting a life-threatening arrhythmia to automatically delivering an emergency defibrillation shock, usually occurs in less than a minute. The LifeVest wearable defibrillator is worn outside the body rather than implanted in the chest. 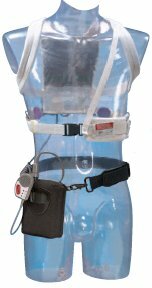 The LifeVest system consists of two main components: (1) an electrode belt and garment that surrounds the patient's chest, and (2) a monitor that the patient wears around the waist or from a shoulder strap. The LifeVest electrodes are dry and non-adhesive to provide patient comfort. The monitor weighs about 1.8 pounds, making it the lightest external emergency defibrillator available.